For several months I have been beating the drum saying that there would be a tradable low for the precious metals in the June/July timeframe. The way to be fairly certain would be using the Commitment of Traders report and Daily Sentiment Indicator to mark an extreme of sentiment. I was looking for the DSI to go below 10 and the COTs to reflect major bearish sentiment among speculators. Well, gold hit 9 on June 15th and again on June 21st. Silver has been stronger and hasn't even set a new low lately. Silver has gotten as low as 10 in Mid-May, again at the end of May and once again on June 26th as gold showed a reading of 10. I would prefer to see a bigger extreme of emotion but there are times you have to take what you get, not what you want. Last week's COTs did reflect a more bearish attitude towards silver and gold by the speculators who drive all commodity markets. They love buying at tops and selling at bottoms. I suspect they are about to get mousetrapped one more time. 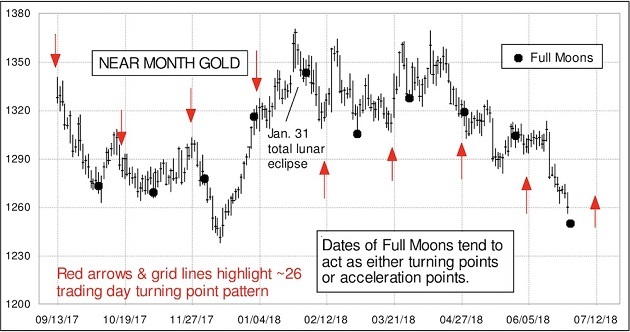 Since silver and gold both went down in the week ending for the COTs on June 25th, the report coming out on Friday June 29th should reflect even a greater degree of bearishness on the part of speculators. There is another factor I only mention on occasion because there is a pinch of voodoo to it. I prefer to stick to either facts or logic based on facts and try to avoid reading tea leaves when I can. But you do what you have to do. One of my favorite writers is Tom McClellan who puts out the McClellan Report. He is definitely one of the 5% of writers who actually put out valuable information you can act on and profit. I highly suggest everyone at least try the 14-day free trial to The Daily Report. I read something from Tom a couple of years ago that for certain falls in the Voodoo category. He had heard that there was a relationship between the full moon and turns in the price of gold. He set out to disprove that theory and utterly failed in his attempt. To his very great surprise, there was a relationship on a regular basis. Either the price would accelerate in the direction it had been going or it would do a U-turn. When I read what he wrote, I discounted it as well. Until I saw it work on greater than a random chance basis. It's not 100% but nothing in life is 100% except taxes and the stupidity of government. June 28th is the date of the next full moon. My prediction of gold going below a DSI of 10 has happened and we are in the June/July timeframe that shows a tradable low on a regular basis. If I'm correct, I will take all the credit. If it doesn't happen, write Tom. I know he will just love hearing from you. And I'm sure he won't mind me stealing the chart from him. 1) Statements and opinions expressed are the opinions of Bob Moriarty and not of Streetwise Reports or its officers. The author is wholly responsible for the validity of the statements. Streetwise Reports was not involved in any aspect of the article preparation. The author was not paid by Streetwise Reports LLC for this article. Streetwise Reports was not paid by the author to publish or syndicate this article.